"It's time to get a little mad." Davey Johnson said this after last night's 0-2 loss to the Cardinals. 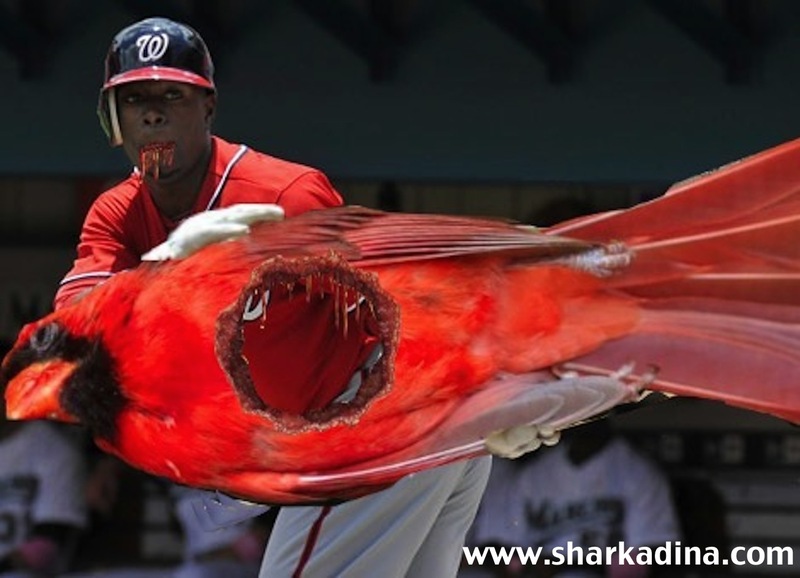 The 10-10 Nats seem to be in a little bit of a slump and our beloved Shark is definitely in a slump, as he is now 0-16 and remains without a hit so far this season. Last night, we were in attendance as he came to the plate and struck out on another questionable strike call by the home plate ump. So yes, Davey, it is time to get a little mad. No one is more mad than The Shark and he's ready to take a big ol' bite out of the Cardinals this afternoon. Will today be the day he gets his first hit? Can the Nationals turn things around? Can someone please get Pete Kozma out? We go into today's game with more questions than answers. Quick programming note: if you're going to the game on Friday, Sharkadina will be there in force with 25 Shark fans! It will be the largest concentration of Shark fans since Sharkadina Night! Come say Hi to us at the Scoreboard Walk if you'll be there!